This was my lunch today. Actually, this is my lunch about every other day at the moment. It's a plate of three varieties of heirloom tomatoes, simply sprinkled with a little salt: Green Zebra, Ananas (Pineapple), and Noire de Crimée, which is similar to Black Russian. The tomatoes are accompanied by cold smoked chicken. On other days I may have ham or boiled eggs, or canned tuna, or some cheese. I sometimes add some other vegetable like cucumber for crunch. But there's always a big plateful of tomatoes. The chicken was delicious, but the tomatoes - oh my, the tomatoes. Whatever doubts I have about whether it was a good idea to buy this creaky old house melt away when I dive into another plate, or bowl, full of locally grown tomatoes. We get ours from Madame Mireille Donnat's stand at my favorite market in the whole world, the farmer's market at Velleron (more about Velleron's market; also check out my Velleron flickr set). The Tuesday market here in Vaison la Romaine is terrific and crazily popular, but Velleron has a special place in my heart. Here's Madame Donnat's stand - she's holding two of her famed tomatoes. They are so heavy with juice that they would make good handweights for building up your arm muscles. When tomatoes are as good as Madame Donnat's, there's no need to do anything with them other than add a little salt, perhaps some olive oil. If your tomatoes are good but not the best though, here's a super easy way of perking them up. This works with cherry tomatoes or regular sized tomatoes. When marinated in dashi, this is simply called Dashi Tomato (だしトマト), and is a standby summer side dish in Japan. You can easily put a Western twist on it though by using vegetable stock. The umami inherent in the tomatoes is enhanced by the stock. I prefer to add salt later rather than in the marinade, since salt draws out too much moisture from the tomatoes. Peel the tomatoes by bringing a pot of water to a boil, and dunking the tomatoes for 30 seconds. Take out the tomatoes, let them cool enough to handle, and peel the skin off. You could also use a tomato peeler for this task. If using large tomatoes, cut them into slices or chunks. Put the peeled tomatoes in a bowl or a plastic zip bag. Add enough dashi or vegetable stock to cover them. Leave to marinate in the refrigerator for a few hours or overnight. Take out the tomatoes, and drain off the liquid. (The liquid makes a delicious soup base.) Season with a little sea salt or soy sauce and toss lightly. Garnish with your favorite garnish - if you're going Japanese, try bonito flakes, shredded shiso leaves, tosted sesame seeds or finely cut nori seaweed; if you're keeping it Western, freshly ground black pepper, a little chopped parsley, or shredded basil leaves work well. Serve chilled. Variations: Add some finely julienned cucumber or blanched and sliced okra. Tomatoes - at what temperature? You've probably noticed that the recipe calls for serving the marinated tomatoes chilled. In North America and Europe, the standard advice from tomato purists is that tomatoes should be served at room temperature for maximum flavor. However, in Japan tomatoes are always served chilled, to take advantage of their watery refreshing quality. 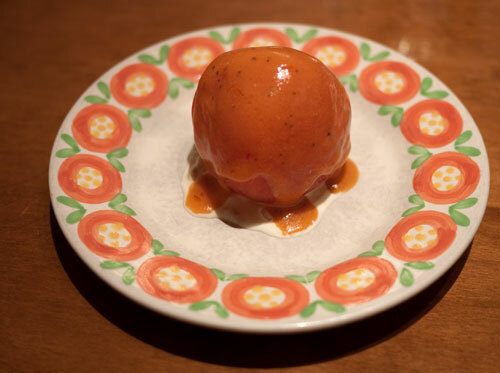 Here's a tomato that I had at famed Kyoto yohshoku restaurant Touyoutei (more about Touyoutei in this article), that was served ice cold - it was so cold in fact that it was almost frozen, and hurt my teeth. It was refreshing though. I prefer my tomatoes somewhere in between ice cold and room-temperature warm. When they are a little bit chilled, they're both refreshing and sweet. So I do store my tomatoes in the refrigerator. I hope the tomato police don't come to check on me. What do you think? How to you prefer your tomatoes? And while we're at it, share your favorite ways to enjoy fresh tomatoes! Submitted by maki on 2010-08-19 13:29. Thank you for the picture of M. Donnat and her tomatoes - like nothing I've seen here! I can enjoy tomatoes either way - room temperature or cold. As a child, my mother grew tomatoes in our garden and I have wonderful memories of snacking on them outside, with a little bit of salt - yuuummmm. An idea for cold, even not so ripe tomatoes ... remove seeds and chop into bite size chunks. Do the same with cold grilled tofu. Mix both together with a dressing made of a little mayo, rice vinegar, citrus ponzu and sesame seeds. Garnish with finely chopped scallion, shallot, shiso or cilantro (optional). Salt to taste. It's juicy, with texture, a little tangy, salty - I love it! For some reason, I can't bring myself to eat cooked tomatoes .. even grilled ones. So raw tomatoes are the best for me. Thanks for posting that you like them chilled too! My foodie friends always give me grief about keeping my tomatoes in the fridge. I LOVE TOMATOES and always prefer them cold and refreshing. I've never experienced any serious flavor loss, they seem crunchier and they don't get mealy as quickly. I'll have to try this! I, too, would get in trouble with the Tomato Police. I just love the taste of them chilled! They remind me of watermelon that way, and I love eating them whole with just some balsamic vinegar and salt. That's too much tomato at once for my Man, so I think I'll give this recipe a go with cut up tomato! Oooh, yum. I love the idea of tomatoes steeped in dashi. Here in Japan I had a similar dish made with roasted red and yellow peppers, but I never thought to apply the same technique to tomatoes. Thanks for the tip! I would have to say I don't like the texture of tomatoes when subject to a standard refrigerator. It ruins the texture and makes it taste a little dry. I used to marinate my bruschetta in the fridge but I found that it's bad for the texture so instead I marinate it outside the fridge with cloth and an ice pack above it. However, room temperature is too warm to store tomatoes, or at least it will be if you're in the right time of year/climate to produce good ones. It's best in my opinion to put tomatoes in a kimchee refrigerator or pickle cellar. As far as the taste sensation of it warm or cold, that's a different question from how it's best to store it. I like the feel of cool tomatoes, but a hot tomato right off the vine eaten like a hand fruit with salt knows no parallel. Amen to that! I ate three today, in fact. I hate the texture and flavour of refrigerated tomatoes. HATE. And I'm a huge tomato lover in ANY shape or form! True, they can rot quite fast if left out at room temp in the middle of summer, but you might as well be eating rotten tomatoes if you've stored them in the cold, dark recesses of the fridge. Disgusting! Heaven is a sun-warmed tomato plucked straight from the vine! Salt optional. Sigh. But I have a tiny confession to make. I grew up tomato-spoiled. See, we grow them in abundance in the backyard. Amen to that. I avoid the refrigerator for the same reason, it just destroys the texture. I *do* like my tomatoes served chilled sometimes, but a bowl of ice water will do wonders without turning them into a mealy mess! One thing I forgot to add - one of the most delicious things about a good tomato is it's smell and tomatoes from the fridge just don't smell like tomatoes. That's part of why my bruschetta formerly suffered from being friged. Oh yes. Cool and very slightly underripe! Definitely. Unless I am eating one just plucked off the vine. And Black Russian--my absolute favourite! I have to admit, I'm a tomato heretic. I love to grow them - I'm proud to say I've managed to get tomatoes as lovely and as large as M. Donnat's - but I don't like to eat them raw. Weird, no? My father loves to munch on them with a little salt. But my hubby and I can just about put up with them. So I'll do a caprese salad, or put them in leafy salad, or somesuch. And sauce. Freshly made sauce is the best. Oh yeah, and I put my Roma tomatoes on pizza, too. Unless I have to, I don't store my tomatoes in the fridge. I do think though they they taste best when they have a hint of cold to them. Warm/room temp tomatoes definitely aren't my thing. Thanks for the recipe, now I have something new to do with my tomatoes! I stumbled upon your site last night and extremely excited! I've been intimidated by creating Japanese dishes with Western ingredients but you have so much information on this particular topic. Thank you! Thank you! Thank you! I just started to receive wonderful heirloom tomatoes through a farm share which I prefer to eat slightly chilled with balsamic vinegar, olive oil and a little salt. I'm embarrassed to say that I've never had Dashi Tomato. I will definitely try your recipe! In our neighborhood there is someone who really likes to plant vegetables. Her tomatoes are the best tomatoes I have ever tasted (though not as big as Madame Donnat's). The supermarket tomatoes are just hard to chew or have no tenderness which I think is because they pick the tomatoes green so they don't have enough time to ripen. My favorite way to have tomatoes in summer is to cut them up into pieces and then add sugar or honey. The juice from the tomatoes dissolve the sugar or honey and then you let it sit with a foil covering over it to keep away bugs. The juice acts as a marinade and if you come back and eat it it tastes sweet and a little sour, perfect for summer i feel. Warm from the summer sun, in the garden with salt and the smell of the tomato vines. You can taste the sunshine. I only put tomatoes in the fridge when I'm afraid they're going to spoil before I can eat them. I like eating them at room temperature best. 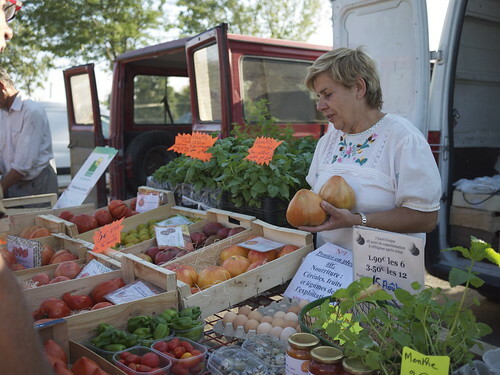 The most delicious tomatoes I ever had was in the countryside in Russia. They were a weird (to me, anyway!) lumpy variety that I hadn't seen before. It was like the uglier, the tastier. Wow! That's great I might try that someday Maki. Although I am a fan of just sliced cold Tomatos with a dash of salt. Yummy snack, but I will try your recipe someday! I love your posts, Maki, but you are dead wrong on the tomatoes! Cold destroys the flavor completely! You need to eat them room temperature as soon after they are picked as possible, unless you are cooking them. Little, sweet tomatoes, fresh from the garden, should definitely be eaten while picking...:) But if any do make it into the house, they should be popped into a little margerine tub, open, so that the cook can snack on them, and if none make it into a salad, so what the heck! Supermarket bought or shop bought tomatoes of any size always go in the fridge in our house, and popping a wee ripe cherry tom in one's mouth straight from the fridge, letting the juice burst...it's a guilt-free guilty pleasure, if you see what I mean. You feel like you're eating a bad-for-you ice pop or something. I had never heard that tomatoes shouldn't be chilled until I saw a program on Food Network about 8 years ago. I saw the logic in that, and started storing my tomatoes outside of the fridge, in sunlight if they needed to ripen a little more and in a dark corner of my kitchen if they were already ripe. But chilled lettuce, tomato, onion, and pickle on a hamburger is the only way to go. 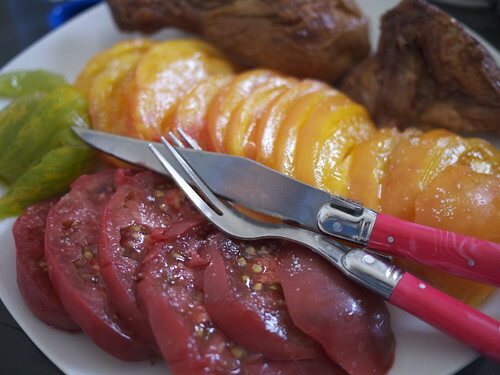 And large beefsteak tomatoes pre-sliced from the fridge is amazing. I like tomatoes any way, from chilled to cooked, juiced, stuffed, and straight from the vine. Have to admit I don't really like tomatoes. Must be from all that fresh tomatoes juice my dad subject me too when I grew up. But I could never resist chilled tomatoes (not frozen, just below the room temp), than cut it up into wedges, and poured sugar on top of them. They are better than the cakes! I had to do a big LOL -- "tomatoe police," !! I have a friend who literally lectures me every time he comes over and see's my tomatoes in the fridge!! By the way, I went to the market today and bought 2 heirloom tomatoes for $12.99! This is of course after seeing those big huge tomatoes in the pic above in that woman's arms. My gosh....amazing. Sent me on a big huge craving. Only in the wacky world of tomatoes do mongrels fetch more than purebreds. Of course, at my local supermarket, the only tomatoes that are actually ripe are the heirlooms so sometimes I have to shell out the money..
maki, is your silverware laguiole? if so, i love the color! back to tomatoes - i love tomatoes & as long as they're not warm (unless it's in a soup or something), i'll eat them any way. yum!! your picture looks delicious! As the subject line suggests, my comment is not about tomatoes, rather, I'm looking for some food guidance. Periodically at my workplace we have themed lunches sponsored/hosted by an individual department. We decorate, create the menu, serve, etc., and our department has decided on Japanese food! Unfortunately, most of our Employees are not very adventurous when it comes to food, so I'm trying to think of dishes that will translate well with an American palate, and hopefully show them that there is a lot more to Japanese cuisine than just sushi. Could you recommend some dishes that might typically be served in September? Meals are served cafeteria style at work, so they would need to be relatively easy to make in large quantities and able to sit out on a tray or in a warmer. I would greatly appreciate any suggestions you might have. September is actually a rather tricky month - you have the end-of-summer things plus early fall things. But assuming you want to go for a cooler weather menu, I might do something like mushroom rice (can be served at room temp or kept warm), salted chicken (or if your budget allows for it, marinated duck breast, both of which can be served cold or at room temperature) and some kind of kinpira (e.g. carrot kinpira and/or some 'instant' pickled vegetables (see the instant pickles series). All of these can be made in advance, and nothing has to be heated up or kept warm. You can also look through the recipes on Just Bento where just abut everything is meant to be eaten at room temperature some hours after they're made. Choose no more than 3-4 things to make though, for the sake of simplicity. You are not authorized to access this page." Today, it still does, as does the Recipes, Archives, and Sitemap page. All the rest remain accessible, including Bentos and Basics, but it is rather disappointing. Please tell me, why is this so, and how can I access the site as I used to? That was a temporary glitch on the server, and has been fixed.